Hye there! It's that time of the year again for all blood-sucking, skin-peeling, eye-popping horror lovers! Today I will be showing you how I did my own Halloween-themed makeup using the Canon EOS M10 camera. By the way, this is my first time trying to draw like this own my face, and since I did it in one take, even the mistakes were highlighted. 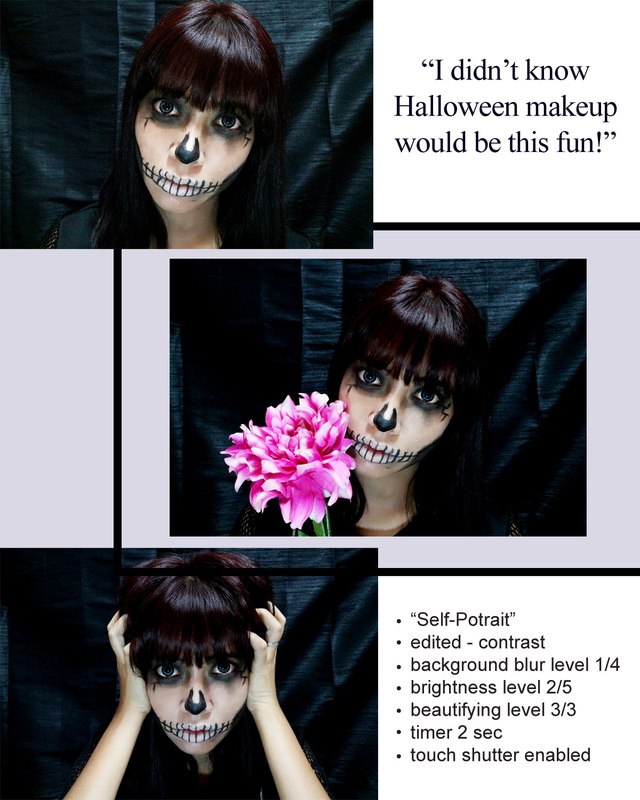 Probably, if you are like me, a beginner at the whole make up stuff, this would be an easy Halloween makeup that even you could do! All you need is a makeup concealer, black eyeliner, pigmented black eye shadow and you're got to go! Check out the tutorial here! Don't forget to subscribe! Do let me know what do you think in the comment box below and feel free to suggest any other themed-makeup tutorials that you would like to see me do. Damn girl!!! 😱 Awesome!! Remind me to not get you upset!!! You're scary!!! Haha. Can't believe it's been that long! I'm really glad we've stayed in touch. I'll be in Japan for two years starting January so maybe I'll make it down again! Keep up the great work! I try half face of this make up before too! Seriously looks cool during HALLOWEEN night party! Interesting make-up there for Halloween theme. I had fun watching you draw your face, although I cannot imagine myself doing it on my own. You did a great job on the make up effects!! Such as talented girls. wow really nice! Happy Halloween, what makeup for lips that make it white? Hye dear I used a concealer..you can check out the video, i have listed all the items that were used.. So many people portrait this character. He is so famous huh. You are looking so cute and totally loved this makeup. I also went for the same ghoul - the skeleton! Impress with your make up. Look so real. so talented! great to see you having fun while doing all these super cool halloween get ups. You are really good in doing the Halloween makeup. I am not sure if I can do this. Can't believe this is ur first time cos u look like a pro!! Wow! I love your Halloween makeup, on point. Cool !! You have good idea to do that ! You are really good in makeup. Want to learn more from you. Cool! you had a great concept for halloween! Like it!